Family Coat of Arms – What is it? Do I Have One? The giant fire on the hearth crackles and burns as it casts dancing shadows across the stone floor and walls. Seated at the table, holding your leg of lamb in one hand and your goblet in the other, your eyes shift their gaze slowly upward from the flickers of the fire’s flame, up above the mantle and onto a large shield fixed on the wall in front of two crossed swords. Upon the shield, you see the engravings of your armorial bearings, two lions pitched in combat in front of a large tree. You reflect upon the families that entrust you to protect them and their lands and that for generations your family has been a banner of strength and protection to the people. And then, your computer beeps. You realize you’ve just received an email. You’ve been daydreaming. You were taking just a minute to research your family’s coat of arms and got carried away in thoughts of history. Older traditions indicate that the coat of arms was held by one individual within the family at a time and could be passed on to the heir. The symbols and insignia would be created to refer to the owner’s life, location, family, or achievements. In today’s world, many people refer to a “family coat of arms” relating to their family name. However, in the past, the coat of arms was a personal marker and could be passed on to family by modifying the the color or other emblems. The motto in the coat of arms would often relate specifically to the person for which the armorial bearings (coat of arms) were designed. The motto is usually located beneath the compartment for English coat of arms and above the crest for Scottish coat of arms. Often the terms “crest” and “coat of arms” are used interchangeably in the vernacular, yet a crest is not a coat of arms. A crest is an emblem or symbol worn upon a helmet or crown. Does my Family Have a Coat of Arms? The answer is probably yes and probably no. No in the sense that having an original family coat of arms specific to your surname and handed down from father to son is unlikely. 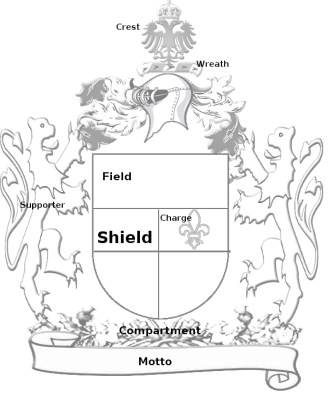 Yes in the sense that you can find a family connection to a coat of arms, and as described above, modify it to fit your family. You can also find coat of arms on the Internet that incorporate elements from your family’s origins. One of the encouraging facts is that certain armorial bearings (doesn’t that just sound cool?) were changed when passed on to other family members, so feel free to even create your own from scratch. Include elements particular to your family history and pass them on. Where Can I Find Resources to Build/Find a Coat of Arms? We’ve listed below certain sites that can help you find or design your armorial bearings. A great resource is 4crests.com which not only provides a picture after searching a name but also gives the history. Many sites only show the picture and it leaves you wondering whether the artwork is authentic. To find out if your family has a coat of arms, you can try searching House of Names. They provide history about the surname and location and dates when a coat of arms for your surname was first used. For specifics on design, Fleur de Lis has suggestions as to the meanings of colors used in the coat of arms, patterns, designs, animals and more. They can do a custom design for you, your family, or even businesses. For putting your family coat of arms on plaques, rings, cups, plates, mounted, etc. visit Coat of Arms. They have coat of arms related to specific geographic areas, and you can customize the motto. You can purchase a digital copy of your coat of arms as well as order an armorial history.